"A work as personal as the one the author went through, "When A Shadow Is Forced Into The Light" is nevertheless the most accessible work offered by Swallow The Sun." Released in 2015, "Songs From The North I, II & III" was one of those works from which one does not emerge unscathed after listening. It seems that the impact of this opus exceeded the scope of his audience because in December 2016, the band's historical keyboard, Aleksi Munter, abandoned his mates following a burn-out from which he could not recover. But it was an even more important tragedy that struck Swallow The Sun, which did not seem to be spared by fate in this fateful year. In April, Aleah Stanbridge (Trees Of Eternity), Juha Raivio's partner, died of cancer, leaving the Finnish sextet leader in a deep devastation. After hiding for many months in the depths of the northern forests, Raivio managed to get up and compose a new opus in which he himself acknowledges that every word and note has been composed thinking to Aleah. If Swallow The Sun's music has never encouraged partying, this "When A Shadow Is Forced Into The Light" goes even deeper into a deep melancholy but of a deadly beauty. 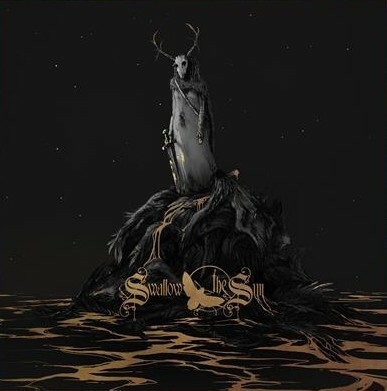 Preceded by the EP "Lumina Aurea" which bathed rather in a dark-ambient with the participation of Einar Selvik (Wardruna) and Marco I Benevento (The Foreshadowing), the new album returns to lands closer to what the band has been offering for over 15 years now. However, the evolution is blinding by instead digging the furrow started during "Songs From The North II" with the majority use of clear vocals from Mikko Kotomäki. The latter is still able to release heartbreaking screams ('When A Shadow Is Forced Into The Light', 'Upon The Water'...) or scary growls ('Clouds On Your Side', 'Here On The Black Earth'...), even if they are only punctual, which reinforces their effect. A gulf of pain, "When A Shadow Is Forced Into Into The Light" surprises with its melodic content. Often playing on the duality of acoustic and electric guitars, or on the duality of clear and extreme vocals, Swallow The Sun even manages to offer bewitching and haunting choruses ('Firelights', 'Upon The Water'...). The other point that will impress you when listening to this album is the multitude of elements that allow you to avoid a feeling of linearity while the tempo remains, as it should be, particularly slow. In addition to the choruses mentioned above, the listener will be astonished by the complexity of the drums on the eponymous track, by the whirling bass of 'The Crimson Crown' which would bring almost a little lightness, by the final explosion of 'Firelights', the crushing crescendo of 'Stone Wings', the lyrics in French whispered by a female voice on "Clouds On Your Side", the devastated landscapes in the middle of which walks a "Here On The Black Earth" agitated with heartbreaking jolts of pain and also endowed with a rare but moving solo, or the chorus of a "Never Left" symbolizing the wound that refuses to close itself. A work as personal as the one the author went through, "When A Shadow Is Forced Into The Light" is nevertheless the most accessible work offered by Swallow The Sun. It is difficult to know if the Finnish band will continue along this path or return to more usual shores during their next opuses. What is certain is that this album will only remain unique because of the pain it translates and that Juha Raivio was able to expel with talent for a result of unlimited richness, delicacy and emotion. Let's wish him to be able to heal his wounds while remaining able to continue to offer us such poignant albums.